As long as you have a sufficiently large enough bankroll to play the Lion’s Pride slot game with maximum pay line spins then you will find it a very appealing and exciting slot to play, however with 100 lines on offer that may be a tad too expensive for some lower stake players. However, there is no getting away from the simple fact that as this is a Microgaming designed slot you are always going to have plenty of winning opportunities, and being available via their instant play and fully downloadable gaming platform you do have a couple of different ways of accessing it too. 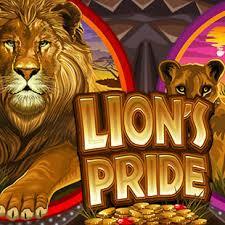 One of the more unique playing structures that sadly you will find being offered on just a small number of Microgaming designed slot games is a 100 pay line structure, and if those types of slot games are what appeal to you then the lion’s Pride slot is certainly one to consider playing when you get the chance to! Those pay lines are not fixed however, and as such when playing this slot at any Microgaming software powered online casino site you can put into play as many or as few of them as you like on lots of different coin value settings, however we have found when playing 100 lines per spin this slot does become a potentially huge paying one! Other than the free spins bonus game of which you will find a full description of below, there are no other bonus games or bonus features attached or on offer on the lion’s Pride slot game. It does come with a range of player adjustable option settings though and you will also find that you can play it with an auto play setting activated and turned on too. Three, four or all five of the scatter symbols which are the Mask scatter symbols by the way spinning into view will award players of the lion’s Pride slot game with up to 20 free spins. However, what you are going to love about triggering and then playing off this free spins bonus game is that you will never know what the multipliers are until you have formed a free spin played off winning spin. Random multipliers can and will be displayed on the slot game screen that can boost the value of your winning payouts by x2, x3, x5 or even x10! One very interesting aspect of this slot game is that there are wild symbols on all five reels, however those wild symbols which for reference are the Logo symbols are stacked on each of the reels so you can spin them in so they cover multiple reel strip positions and could form lots of winning combinations when they do so! The Lions Pride wild Logo symbol is going to award a 1250 coin jackpot when you get five of them on any activated pay line per coin you wagered on that winning spin but being stacked wilds you could form lots of jackpot paying winning combinations! If you can for to give this slot game plenty of maximum pay line spins then it is certainly a slot worth playing, but as it can be a medium to high variance slot at times only ever play it for sensible stake levels, those being fair low valued ones!